What initially interested me about Walker Percy was reading in a critical volume quite a few years back that he was a “Southern existentialist.” Having read some of Kierkagaard and Heidegger in college – a time when I was trying so very hard to be an intellectual – and being a admirer even now of both Albert Camus’ and Jean-Paul Sartre’s works, this concept stuck with me: a Southern existentialist . . .
Walker Percy was born in Birmingham, Alabama in 1916 – the same year as Albert Murray, author of Train Whistle Guitar – however Percy is most often associated with Mississippi and Louisiana. Percy came from a prominent Southern family whose ranks held powerful businessmen and politicians, yet the darker side of this grandeur came in the form in suicidal tendencies, which the claimed the lives of both his father and grandfather. (For a somewhat deeper explanation, read this online piece from The New York Times.) Browsing around at some critical commentaries, I’ve found that there are similarities between Walker Percy’s grim, archetypally Southern-aristocratic family background, as well as the characters in his fiction, and William Faulkner’s Compson family, and Quentin in particular. Oh how the mighty have fallen! Despair is the word that Walker Percy uses here— not to be searching for something beyond the “everydayness” of our lives causes despair. Binx Bolling’s assertion here very much echoes the philosophy of Kierkagaard – whose The Sickness Unto Death is quoted in the front matter – and very much resembles other characters in mid-century existentialist fiction, like Meursault in Camus’ The Stranger or Mathieu in Sartre’s The Age of Reason. These men, deeply unimpressed by the options offered to them by society, are searching for something beyond the “everydayness” . . . also, these men confound the people around them with their refusal to behave like everyone else. Yet, the swirl of psychological turmoil in the novel does not belong entirely to Binx. We also have Kate, the possibly mentally ill, possibly just frustrated cousin, and her stepmother, Binx’s Aunt Emily, the wife of his uncle Judge Anse. Aunt Emily is a driving force who seeks to change Binx’s fortunes by altering his whole life’s course away from a willy-nilly pattern of whimsical self-indulgences peppered with deep philosophical yearnings and toward a life more suitable to family traditions that yield to more conventional notions of greatness. We find out early in the novel that Binx is twenty-nine and very keenly aware that the age of thirty is looming. And at this crux in his life, his aunt is pressuring him to do two things: first, she insists that he assume some occupation befitting their family name, some stature of importance beyond raking up the money made from shifting money around while passing time sleeping with various of his secretaries; and second, she wants him to help with Kate, who is floundering personally and who has attempted suicide through an overdose of pills. However, Binx is more interested in finding a way to sleep with his feisty current secretary (or her roommate) or in languishing indefinitely with Kate, who isn’t sure he is able to help at all. I have a drink and look at her corner. The moonlight seems palpable, a dense pure matrix in which is embedded curbstone and building alike. Heavily loaded exchanges, like this one, in the novel occur between a variety of characters, lace the conversations with existential meaning. The whole thing is laced with this overlain sense of what-are-we-doing-anyway? But these few characters don’t constitute the whole she-bang. Binx has some other things to contend with, too. For example, he visits his mother (and a whole passel of his step-siblings) in the fish camp where she and her new family are, and he learns things he didn’t know about his family when he sells some family land to a man named Mr. Sartalamaccia, who it turns out built the house on the land. We gets sense through Binx’s many dealings of just how flippantly he handles everything in his life. 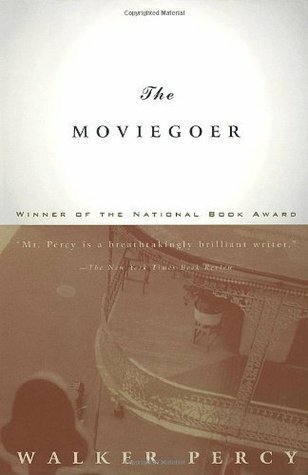 The Moviegoer, like some of William Faulkner’s novels, is another in that Southern literary tradition that discusses the fallen generations of once-great Southern families. Binx Bolling is a lackluster financial planner with no motivation, and Kate is a disturbed semi-invalid. Aunt Emily is totally offended by all of this nonchalant mediocrity, as she explains in great detail towards the end of the novel in a diatribe aimed at Binx’s refusal; despite her line-in-the-sand deadline to determine what his path to greatness will be, her nephew provides her with nothing but flaccid non-answers. She continues on, in basically the same vein, elaborating the great philosophy of Southern aristocracy and its noblesse oblige. And Binx’s response is simple: an utterly idle so-what. He makes no attempt to answer her assertions or her charges. He makes no attempt to defend himself or to prove her wrong. He is not impressed by her speech, nor by the people who she holds up as models of impressiveness. To Binx Bolling, the whole Southern upper-crust thing is sham— even though from our position outside looking in, we watch him enjoy the benefits of the privileged upbringing that he is rejecting. There is a lot more to this novel than I’ve written about here – just as was the case for Train Whistle Guitar – mainly because I don’t want to spoil it for anyone who wants to to read it, but hopefully I’ve danced along the surface of the major points well to make my point: The Moviegoer is an incredibly deep novel, very well-written, and also exists outside the norm of Southern fiction, too much which focuses on the certainly expected topics of race, the Civil War, the Depression, and/or Civil Rights. For example, race plays a minor role in this novel, mostly in the form of a male servant named Mercer who is extremely dedicated to Aunt Emily’s service; his interactions with Binx and his power inside the house belie the complex nature of Southern race relations. No, this novel deals far more in the delicate ambivalence of latter-day generations of aristocratic families, young men and women who have enjoyed social and economic privilege but who have no desire to take up the mantel of the Old South and continue the traditions. I bring up The Moviegoer and Train Whistle Guitar not to criticize the mainstream traditions to Southern fiction, but to point out that some works that exist on the fringes of that mainstream go along way to exploring equally important truths. Certainly, To Kill A Mockingbird and Gone with the Wind are important Southern novels, but then I ask: Okay, what else? These two novels are two among many answers to that question.